Suppose you're looking for a car that has good cargo space, but you don't want a full-size SUV there are lots of options to choose from. Now suppose you want the same car but with great gas mileage. In this case, you're looking at the Honda HR-V. There is nothing more reliable that driving a Honda. After all, Honda has been known since the beginning of time to have reliable cars. If you're located in Northern California, stop by the friendly Honda dealer in Lodi. Located at 1700 S. Cherokee, Lodi Honda serves Stockton, Elk Grove, Sacramento and The San Joaquin Valley. The 2016 Honda HR-V has an MPG Rating of 28 City / 35 HWY. Features seating for five people, a 7" Display audio touch-screen, HondaLink next generation, multi-angle rearview camera, and roadside assistance. The three models to choose from include the EX, LX, EX-L. Colors you can choose Red, Blue, white, black, green, metallic steel, and mulberry. The interior colors have an option of black fabric or gray fabric. The Honda HR-V is equipped with a 141HP 4-Cylinder Engine and 17" Alloy Wheels. Safety features include vehicle stability assist with traction control, anti-lock braking system, electronic brake distribution, brake assist, tire pressure monitoring system, daytime running lights, front / side airbags, advanced compatibility engineering body structure, and child-proof rear door locks. In addition to the safety features, the 2016 HR-V boast of an impressive list of interior features as well! Features include air-conditioning with air-filtration, automatic climate control, 5" LCD screen,7" Display Audio screen with high-resolution, Bluetooth capabilities, Push button start, programmable power door locks, leather-wrapped steering wheel, Homelink remote system, map lights, rear-seat center armrest, floor mats, 12-volt power outlet, Beverage Holders, leather-trimmed seats, heated front seats, fold-down rear seatback, multi-information display, blue backlit gauges, 160-watt AM/FM/CD audio system with 4 speakers, HD Radio / XM Radio Pandora, USB audio interface, exterior temperature indicator, a sunglasses holder, and a maintenance minder system. Cargo space is 24.3 Cu ft. The HR-V is a stylish car for any car enthusiasts! Rest assured your Honda is going to be in good hands! 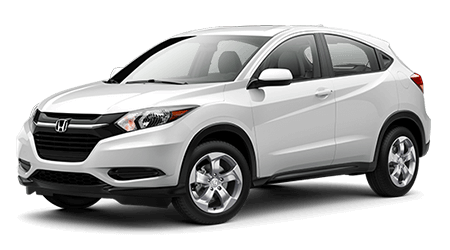 The 2016 Honda HR-V has a 3-year/36,000 Mile new vehicle limited warranty, a 5-year/60,000 mile limited powertrain warranty: Ordinary maintenance or adjustments excluding parts, an accessory limited warranty, replacement parts limited warranty for 1 year, remanufactured parts limited warranty for 3 years or 36,000 miles, and a 5-year/unlimited mile corrosion limited warranty. Let Honda take care of your car so you can have the peace of mind while driving! If you're in the Sacramento area stop by Lodi Honda. The Friendly Honda dealer of Lodi Honda will be sure to put a smile on your face as their knowledgeable staff help you select the 2016 HR-V for you and help you find the best deal possible! From experienced to novice drivers, Lodi Honda has a vehicle for every person that satisfies their style and need for driving!